One of the more popular home trends is outdoor living, and adding a new deck is one of the most requested home enhancements. 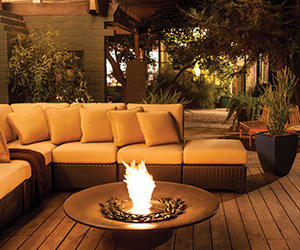 To fuel the interest, there are a number of exciting new durable outdoor products designed to visually tantalize, and also withstand the Midwest seasons. Exciting new deck materials, full kitchens, and deck-friendly fireplaces are just a few of the options offered by Geneva Deck to enlarge your living space. The separation between indoors and outdoors disappears. The marriage between your indoor living space and the outdoor area on the other side of the door is becoming increasingly valuable. Our goal is to provide you, through our products and services, with additional space of exceptional quality for your comfort, cheer, and lifestyle. Gorgeous, durable products are meant to be enjoyed, and Geneva Deck offers enhancements to take your deck to new dimensions. Our custom design capabilities offer versatile options for your new home extension, including outdoor kitchens, cabinets, fireplaces, furniture and lighting.